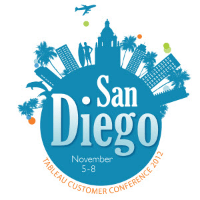 The 2012 Tableau Customer Conference was held this past week in San Diego, and I was fortunate enough to be sponsored by Tableau to attend as one of three “Iron Viz” contestants. I didn’t win, but my wife Sarah and I spent the week in the company of unbelievably talented data visualization enthusiasts – a reward worth it’s weight in gold, to be sure. Networking in “Community Alley”: After over a year of interacting with an amazing online community of Tableau users and employees, I finally got the chance to meet many of them face to face for the first time. This was the best part of the conference for me, by far. Dustin Smith’s “Community Alley” was a great place to hang out between sessions – there was a Lego table and a remote controlled floating shark. Hard to beat, right? I had the humbling experience of playing Boggle against Andy Cotgreave. Let’s just say I’ll have to memorize the dictionary before a rematch. Round 1: Andy – 23, Ben – 2. Wow. Learning at Sessions: I had the chance to hear a number of great talks, the best of which were Jock Mackinlay’s “The Science of Visual Analysis”, and Malcolm Gladwells keynote speech about “Practical Innovation”, where he compared Apple in the 1980s to the Israeli army in the 1960s and 70s – desperate enough to take the best of anyone’s ideas and make them actually work. I was in the second row for Gladwell’s keynote, which was incredibly cool. Listening to him speak was just as easy and enjoyable as reading his books. Previewing Tableau (Gr)8: Any time you have a software development team that gets up on the stage for the opening keynote and totally steals the show, you know you have talented folks. The developers talked about what they have added in Tableau version 8, and the crowd was blown away. From overlapping charts on dashboards to new vizzes (think, tree map bar charts) to better data blending and performance, Tableau 8 is a big step forward, without a doubt. Here’s a review by ZDNet. In closing, I want to thank Tableau for the sponsorship and the great hospitality. You were a pleasure to be around, and pulled off an amazing conference. You have some incredibly smart customers, and I’m thrilled to be among them. Here’s to next year in D.C.! It was great to finally meet you in person, Ben. And it was nice to meet Sara as well. You’re a pretty special vizzer…keep it up!